Heating & cooling, access panels & doors, colors and penetrations are examples of the flexibility that can be designed into every enclosure when it's built. Enclosures are also part of planning for flexibility in future use case. There's a clear and widespread trend of municipalities and water districts gradually replacing double check backflow valve assemblies with reduced pressure zone valves. This is being done for a variety of reasons (check out our free downloadable guide to trends for more info) but is generally driven by the awareness of cross contamination risks of DC valves and the inherent flaw in a backflow preventer that will return the water to the public supply in case of a valve malfunction. While that's not yet required in many locations, the process of permitting for a new use at some point in the future almost certainly opens up the possibility for new infrastructure requirements to meet the future code. So whether the future use case represents a higher risk classification or not, it's likely that a new lessee with a different use case would require approval - and the basis for future approval could well include replacing an existing DC with an RPZ. As awareness grows of the property damage risk of RPZs inside a facility, that means more are being specified for exterior installation. And the inherent incompatibility of RPZs and vaults means they're being installed above grade. Making those changes later will be VERY expensive and disruptive. So why not simply design that in today as you build? Lack of awareness and aesthetic concerns are the biggest barriers. The seemingly minor component of a backflow enclosure - often simply referred to as a "hotbox" - may actually be key to designing in future flexibility. We've got a number of answers for both. Check out our educational resources and our custom enclosures page which features photos of various innocuous installations. Enclosures for backflow preventers is only part of what we do. Equipment shelters and machinery enclosures are common as well - and experience tells us that the requirement today is often very different than the needs tomorrow, which are often only clear in retrospect. 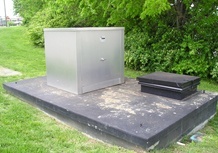 Plan for the unknowns when designing your custom enclosure. 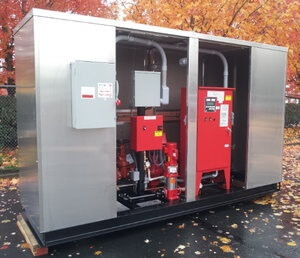 Whether it's protecting a remote pump, covering a unit on the roof of a sky scraper, or protecting a generator or compressor right behind your facility, build in flexibility. Here is an example of what can happen if you choose to put backflow preventers in vaults. This car dealership had to change from a double check to a reduced pressure zone backflow preventer. That means they needed to not only purchase a new device, but also a new enclosure to go with it. This enclosure needed to be mounted to a skid. It includes multiple removable doors for easy access without needing a lot of extra space around the equipment. The enclosure is compact, but satisfies all the client's needs.